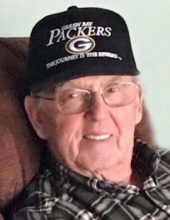 COTTAGE GROVE-Claude “Mac” McAllen, age 83, of Cottage Grove, passed away on Wednesday, April 10, 2019, at home with Diann Winchester, his partner of 34 years by his side. Mac was born on April 3, 1936, in Crandon, the son of Thomas and Monnie Foster McAllen Dault (Leo Dault Sr.). Mac was raised in Sheboygan and liked to say he was educated in the school of hard knocks. He enjoyed an illustrious 48-year career with Hobart Sales and Service, spending four years in sales in Pittsburgh, PA then returning to Madison to become the District Sales and Service Agent from 1964 to 2008. He was also the founder of McAllen Properties, a commercial real estate development and management company. In addition to Diann; he is further survived by his daughters, Kathleen McAllen (Jeff Thornton), Kelly McAllen (Stephane Collot), Kerry McAllen and Diann’s daughter, Lauren Winchester; grandchildren, Haley, Hannah and Jacob Ruzow, and Julian and Olivia Collot; and sisters, Ione Weiss, Dorothy (Roger) Konz and Nancy Ploetz. He was preceded in death by his brothers, Luther McAllen, Tom McAllen and Leo (Donnie) Dault Jr.; and his brothers-in-law, Edward Weiss and Tom Ploetz. Honoring Mac’s wishes no services will be held. His remains will be interred at Roselawn Mausoleum at a later date. A celebration of his life is being planned by McAllen Properties. In lieu of flowers, memorials may be made to The Salvation Army, Wisconsin Public Television, Second Harvest Food Bank, or the Alzheimer’s Association. A special thank you to the staff at the Colonial Club Day Center in Sun Prairie who took such good care of him over the last year and to Agrace HospiceCare who helped us through the last few weeks. May he rest in peace. Online condolences may be made at www.gundersonfh.com. "Email Address" would like to share the life celebration of Claude "Mac" McAllen. Click on the "link" to go to share a favorite memory or leave a condolence message for the family.